Laoban Dumplings, a grab-and-go dumpling spot, and Bindaas, a sit-down Indian restaurant with vibrant decor, both opened Monday in 2000 Penn. Updated: Nov. 9, 2017 at 10:20 a.m.
Laoban Dumplings, a grab-and-go dumpling spot, and Bindaas, a sit-down Indian restaurant with vibrant decor, both opened Monday in the complex. 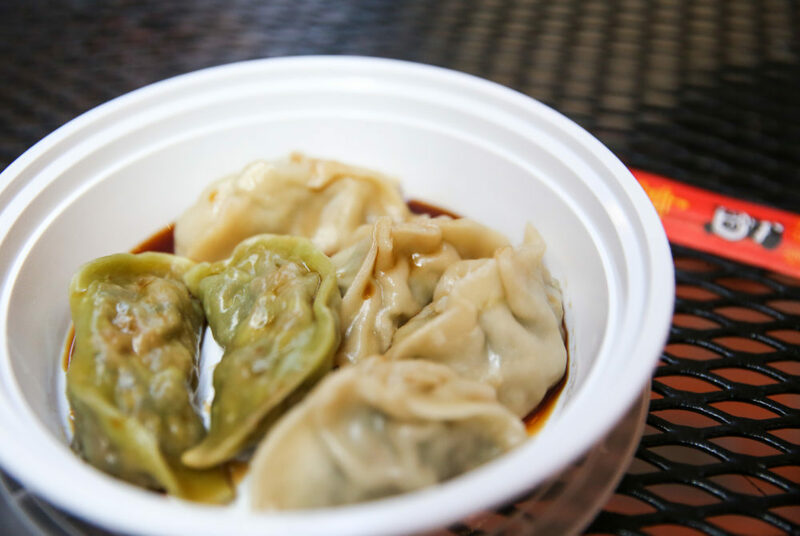 While Laoban Dumplings only announced its opening on campus in late September, Bindaas has been awaiting its debut since December 2016. Their cuisines and atmospheres differ dramatically but both provide high quality options that branch out from other traditional food offerings on campus. Tucked away in the halls of the complex bordering Bertucci’s and diagonally facing CVS, Laoban Dumplings offers a simple menu of classic Chinese dumplings infused with innovative, modern flavors. The stand features a rotating weekly menu and currently offers two distinct flavors of dumplings: the deliciously savory pork cilantro and the spicy vegetarian livin’ on the vedge. Laoban Dumplings offers eight dumplings of any combination for $10, or six dumplings for $8, and the option to add a complementary sauce. A simple yet classic variety of dumpling, the pork cilantro takes its name from its two chief components, while the livin’ on the vedge has a more complex, unique base of bok choy, shiitakes, scallions and Chinese chili crisps. Both dumplings are wrapped in the owner’s soft, signature handmade dough, cooked in steamers that are easily visible behind the front counter and served hot. They come with well-apportioned, optional sauces, including the peppery “Fiery Godmother” sauce, which comes with a kick, and the sesame soy sauce “So So Sesame.” In addition to the dumplings and sauces, the stand offers a variety of teas and carbonated drinks as well as a cuke salad with miniature marinated cucumbers ($2.50). Though it currently only accepts credit cards, Laoban Dumplings has applied for GWorld membership and is pending review, an employee said. While it does offers some seating, six stools at a bar overlooking Bertucci’s, the shop is intended to be more of a grab-and-go lunch destination. The hanging plants, a neon light sign and the shop’s animated dumpling cartoon add to the approachable and attractive atmosphere. With limited space and quick turnaround times – I waited less than five minutes for my meal – it fits the bill for a quick lunchtime stop. It is open seven days a week from 11 a.m. to 8 p.m.
Bindaas, the casual counterpart to well-acclaimed restaurants like Rasika and The Bombay Club, lies on the corner of 20th Street and Pennsylvania Avenue in the complex. Like Laoban Dumplings, the sit down restaurant has yet to join GWorld but plans to offer it in the future. The avocado golgappa ($7) is a Bindaas specialty appetizer, or chaat, featuring four paper-thin fried shells sumptuously filled with avocado. This sophisticated take on a traditional Indian snack food is generously topped with sweet yogurt and tamarind chutney, giving it a sweet yet spicy tinge. A main dish, the pao bhaji ($10), was enthusiastically described to me by the waiter as “the Indian counterpart to an American Sloppy Joe.” But don’t be deceived – the lightly toasted and delicately buttered roll with its accompanying seasonal vegetable stew created an elegant and flavorful dish, unlike the traditional, greasy American sandwich. It came with two warm rolls, a generous serving of the savory stew and an assortment of chilled, chopped vegetables as palate-cleansers on the side. The evening was topped off with the Chili Salmon Shashlik ($14), a salmon kabob cooked evenly through and served hot alongside grilled green chilies and atop a hearty serving of coconut-infused yellow rice. While it certainly is affordable – no dish exceeds $15 – its classy modern decor and candle-topped mix of mahogany and marble tables, as well as its extensive wine list, indicate the slightly upscale nature of this new Indian enclave. Bindaas hosts about 75 table seats, as well as additional bar seating and will be open Sunday through Thursday from 11 a.m. to 10:30 p.m. with extended hours on Friday and Saturday, as well as a weekend brunch.